Drawing on several of his earlier “Bab Ballad” poems, Gilbert imbued this plot with mirth and silliness. The opera’s humour focuses on love between members of different social classes and lampoons the British class system in general. Pinafore also pokes good-natured fun at patriotism, party politics, the Royal Navy, and the rise of unqualified people to positions of authority. The title of the piece comically applies the name of a garment for girls and women, a pinafore, to the fearsome symbol of a naval warship. 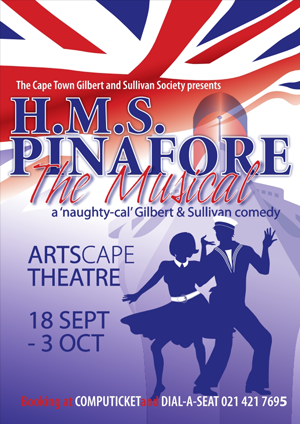 Pinafore’s extraordinary popularity in Britain, America and elsewhere was followed by the similar success of a series of Gilbert and Sullivan works, including The Pirates of Penzance and The Mikado. Their works, later known as the Savoy operas, dominated the musical stage on both sides of the Atlantic for more than a decade and continue to be performed today. The structure and style of these operas, particularly Pinafore, were much copied and contributed significantly to the development of modern musical theatre.